Purpose - The purpose of this site is to provide a method for conveying information concerning Clairemont Girls Fastpitch Softball to participants and other interested parties. Information in this site supplements the more traditional methods of information distribution, such as flyers and the League Directory. It also allows for timely updates concerning Board member's positions, phone numbers, and team standings throughout the season. Community - Clairemont is a community within the city of San Diego, located approximately 6 miles north of downtown San Diego, bounded by Interstate 5 to the west, Interstate 805 to the east, State Highway 52 to the north, and the Tecolote Canyon Golf Course to the south. But hey, you can live outside these boundaries, we don't care. You can live anywhere, as long as you can make practices and games. So come on over! 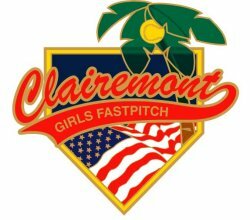 Logo - The Clairemont Girls Fastpitch logo is copyright 2005- 2019, Clairemont Girls Fastpitch. This logo replaces the previous logo designed by Lindsay Wood, which was the winning entry of a logo contest conducted in January and February, 2000 (used 2000 - 2005). Background - The baseball field background is derived from and used by permission (thanks!) of the author Carrie Overfield (1999, Buffalo, N.Y.). In The Beginning - To view our original, non-dynamically (static web pages) created web site, please visit our first pages.